LEAK-PROOF - With our leak-proof trash can, you don\'t have to worry about coffee or food spills inside your car. trash cans can be used not only to hold your wrappers, tissues and other unwanted trash but also to contain your liquid leftovers such as coffee, juice, water and other similar liquid. 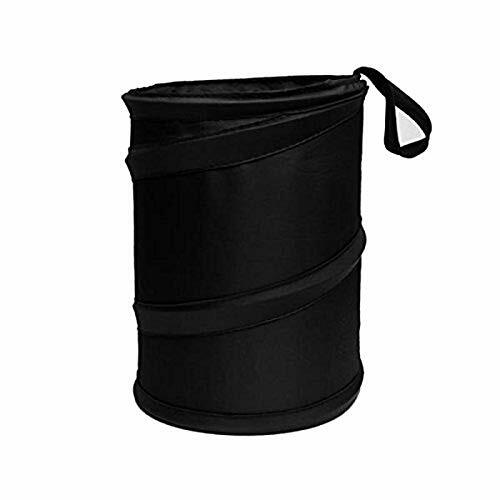 PRACTICAL - Trash can is a must have for drivers & travelers alike. Our trash cans are designed in a most practical way. They take up minimal amount of space, causing no reduction of your legroom, but provide an adequate holding capacity. CLEANLINESS - Our trash can helps to keep your car clean & tidy. It is very handy and convenient to have it in your car on a trip as you can easily dispose of the trash whenever and wherever you want. PREMIUM QUALITY - Made out of premium quality materials, our trash can is high in strength, durable and has long service life. IF you encounter any quality problem with our trash can within 3 months after purchase, we will send you a new one free of charge. Feel free to email us and we will do our best to help you.